This is a call for papers for a special issue for the multidisciplinary, open-access journal PLOS ONE. The guest editors for the special issue include a medical anthropologist (Philippe Bourgois), a medical sociologist (Lindsey Richardson), a researcher in social determinants of health (Hannah Cooper), a psychologist (Carl Hart), and an MD/medical researcher (Daniel Ciccarone). In other words, social scientists are very much encouraged to submit abstracts. The editorial team seeks contributions to this Collection that: 1) Assess the impacts of drug use-relevant policies for human health, 2) Evaluate the effectiveness of novel structural prevention and treatment interventions and 3) Identify and measure the contribution of social, structural and environmental conditions to SUD prevention, recovery and relapse. The accepted papers will form a PLOS ONE Collection/PLOS Medicine Special Issue, to be published in November 2019. Contributions should be submitted by June 7, 2019. The journal PLOS ONE is published by the Public Library of Science (PLOS), a non-profit open access publisher and advocacy organization and selects submissions for scientific rigor rather than perceived impact. As an interdisciplinary journal, PLOS ONE is open to all empirical research methods. You can find more information here: https://collections.plos.org/s/substance-use. This entry was posted in Uncategorized on 29 March, 2019 by Shana.Harris. Boston Medical Center is seeking a PhD-level medical anthropologist to serve as a postdoctoral research associate. This individual will work alongside an interdisciplinary research team in BMC’s Clinical Addiction Research and Education Unit on a CDC-funded examination of public health-public safety partnerships for post-overdose outreach throughout the state of Massachusetts. The postdoctoral research associate will be primarily responsible for conducting ethnographic research and targeted qualitative interviews among law enforcement personnel and individuals who may be at risk of overdose. The associate will also be heavily involved in data analysis and dissemination. A research mentor specializing in medical anthropology and ethnographic research among people who use drugs will oversee this position and provide training and support throughout the appointment period. This is a 12-month appointment with an anticipated start date of June 2019, with a chance for renewal. PhD must be in hand by the time of appointment. Applicants should have a Class C driver’s license (travel will be reimbursed) OR willingness to travel on public transport. 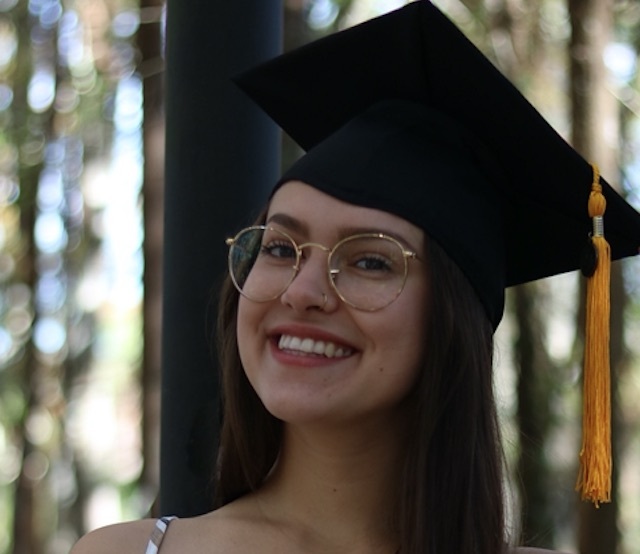 Successful candidates will hold a PhD in social science, with preference given to cultural or medical anthropology, and have experience conducting independent qualitative or ethnographic research. Additional training or experience in public health is preferred, as is experience with qualitative analysis software, such as NVivo, Atlas.ti, MaxQDA, or Dedoose. For this project, candidates should possess a critical understanding of qualitative research ethics and be able to maintain the high levels of confidentiality, humility, and decorum necessary for working with vulnerable populations. Candidates with experience recruiting and conducting research among individuals who engage in high-risk substance use are especially encouraged to apply. Successful candidates will have strong written and oral communication skills and be able to work productively to bring research findings to publication in a timely fashion. Please email a cover letter and resume/CV to Katherine Waye at Katherine.waye@bmc.org. Desired candidates will be requested to submit two references. This entry was posted in Uncategorized on 28 March, 2019 by Shana.Harris. 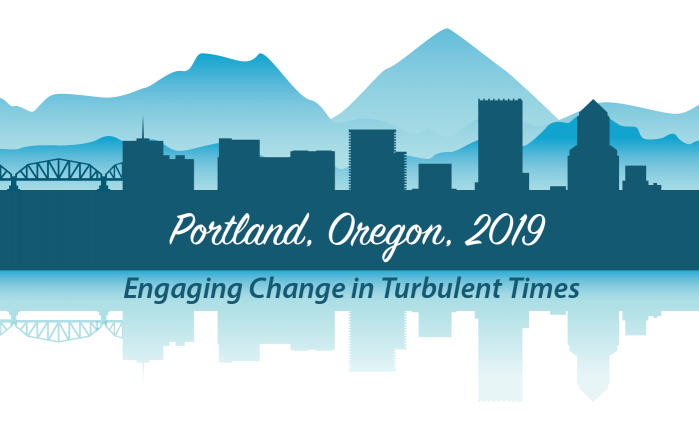 We are just one week away from the 2019 Society for Applied Anthropology annual conference in Portland! There are several panels, papers, posters, and events about alcohol, drugs, tobacco, and related topics! Below is a list of presentations and activities that will be of interest to ADTSG members, many of which involve our members. And don’t forget to come to the ADTSG Business Meeting on Friday, March 22, at 5:30! All are welcome! This entry was posted in Uncategorized on 13 March, 2019 by Shana.Harris. Over the last decade, anthropologists have contributed numerous critical insights to the study of drug and alcohol use. We have questioned drug and user criminalization, highlighted widespread stigmatization, scrutinized treatment management, and challenged the representation of addiction as a chronic disease. Our critical work also includes interrogating terms that are “native” to the drug and alcohol field, such as “addiction,” “health,” “recovery,” and “rehabilitation.” Anthropologists and other scholars have shown the constructed and contingent character of these buzzwords by examining their historical, geographic, moral, and ethical foundations. Curiously, however, we continue to use these terms in our work, often reproducing the imaginaries we seek to critically address in the first place. In many studies, anthropologists enmesh the empirical experiences that they observe in the field with the analytical categories they use to understand them. As a result, what anthropologists and the people we study mean by such terms as addiction, health, recovery, and rehabilitation are often unclear or unquestioned. This panel explores these issues by critically examining the roles these buzzwords play in anthropological investigations of drug and alcohol use. In our analyses, how do we use these terms and the concepts they support? How do we contend with their specific histories and sociocultural undertones? Do we, as anthropologists, accept or resist the related discourses, ideologies, and assertions that circulate within the drug and alcohol field? We invite ethnographic theoretical papers that scrutinize these terms and the concepts they support; explore their meanings to individuals, institutions, or policies; analyze how they are used, reproduced, or resisted; and discuss their potential for future anthropological inquiry. We are particularly interested in papers that examine how empirical concepts and accounts monopolize or dominate our analytical thinking without us noticing. Given the large production of scientific research on drugs and alcohol by American scholars, we particularly invite discussion on how the local redefinitions of the treatment concepts play out in other geographical locations in the global north and south. Please submit an abstract (250 words max.) via email to the panel organizers at aleksandra.bartoszko@vid.no and shana.harris@ucf.edu by MONDAY, MARCH 25, for full consideration. Presenters will be notified of selection by April 1. This entry was posted in Uncategorized on 5 March, 2019 by Shana.Harris. This entry was posted in Uncategorized on 1 March, 2019 by Shana.Harris. Apply to become a fellow of NIDA-funded HIV & Drug Abuse Prevention Research Ethics Training Institute! Fellows have published their mentored research studies in peer-reviewed journals, presented the data at national and international conferences, and incorporated it as pilot data for grant applications. To see fellows’ accomplishments, please visit: fordham.edu/ethicsinstitute. Visit our website fordham.edu/ethicsinstitute for the application form or contact Rimah Jaber at ethicsinst@fordham.edu for more information. Applications are due March 15, 2019, subject to availability of funds. Applicants will be notified of award decisions by April 30, 2019. Addiction and its treatment are now central concerns in the U.S. and increasingly worldwide due to the recent stark rise in opioid use and overdose death. Attention to opioid addiction, treatment, and overdose prevention has intensified with the emergence of new groups of relatively socially privileged drug users, with particular attention to White middle-class users in suburban communities. In the U.S., analysts have drawn on narratives of opioid addiction as a symptom of social suffering rooted in Post-Industrial economic dislocation among poor and working class Whites to frame the current political climate. Shifts in popular news, social media, and viral video have intensified the circulation of images and discourses on opioid use. The spectacles of suburban White prom queens in recovery, parents overdosing in cars with children present, and “mobile morgues” used to manage the overwhelming number of dead bodies rapidly circulate online. This social, political, and economic context has intensified the moral panic of what is now commonly referred to as the “opioid crisis,” and has troubled fundamental beliefs about “addiction” and “addicts,” but also about whiteness. Brodkin (2001) calls for increased attention to the “variations, ambivalences, and contradictions within whiteness and alternatives to it” (p. 149). The papers in the panel respond to this challenge, leveraging ethnography to trace the fractures in whiteness in diverse local contexts. Interested participants are invited to submit a proposed title and 250-word abstract to Allison Schlosser (avs29@case.edu) and Emily Metzner (emilymetzner@gmail.com) by March 11, 2019. Decisions on panel inclusion will be made by March 18, 2019. Brodkin, K. (2001). Comments on “Discourses of Whiteness.” Journal of Linguistic Anthropology, 11(1), 147-150. Hansen, H. (2017). Assisted technologies of social reproduction: Pharmaceutical prosthesis for gender, race, and class in the White opioid “crisis.” Contemporary Drug Problems, 44(4), 321-338. Hansen, H. & Skinner, M. (2012). From white bullet to black markets and greened medicine: The neuroeconomics and neuroracial politics of opioid pharmaceuticals. Annals of Anthropological Practice 36(1), 167-182. Levine-Rasky (2016). Whiteness fractured. New York: Routledge. Mendoza, S., Rivera, A., & Hansen, H. (2018). Re-racialization of addiction and the re-distribution of blame in the white opioid epidemic. Medical Anthropology Quarterly, 00(0), 1-21. Netherland, J. & Hansen, H. (2016). The war on drugs that wasn’t: Wasted whiteness, ‘dirty doctors,’ and race in media coverage of prescription opioid misuse. Culture, Medicine, & Psychiatry 40, 664-686. This entry was posted in Uncategorized on 15 February, 2019 by Shana.Harris. 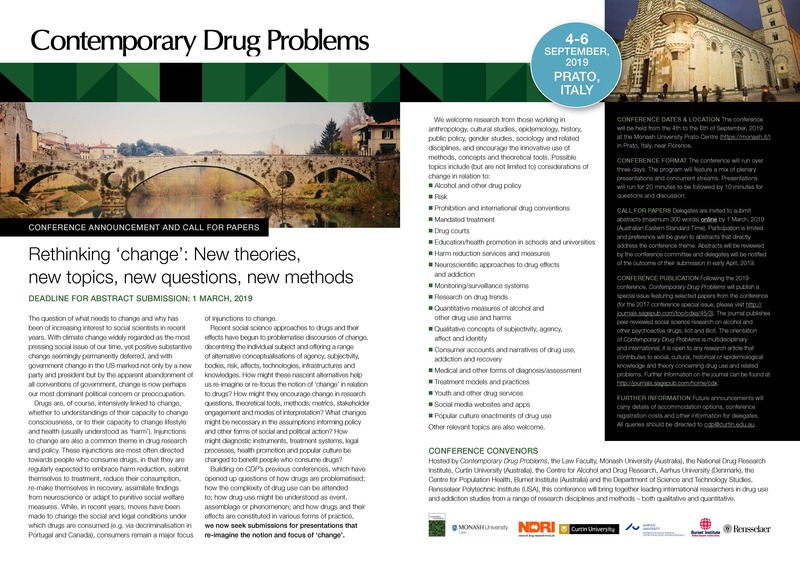 Abstracts for the 5th Contemporary Drug Problems conference in Prato, Italy, are due March 1, 2019! In this installment, we are profiling Megan Sarmento, a recent B.A. graduate from the University of Central Florida. I was sure that I wanted to study humans at the college level, but I only confidently knew that cultural anthropology was my field once I figured out how it differed from other studies like sociology, psychology, humanities, etc. I chose anthropology because it was the first research area that I felt paid enormous attention to the first-hand experiences and concerns of oppressed peoples. By using ethnographic methods, anthropologists attempt to break down barriers between “Other” cultures and make more connections. The prospect of changing powerful structures in Western society in order to better uphold global human rights is the ultimate reason why I found passion and hope in anthropology. I believe it can help me work to change the world for disadvantaged people who need help challenging deeply-rooted systemic problems. The dominant abstinence-based approach to drugs and alcohol in the U.S. has resulted in an uninformed and unprepared society who now abuses harmful substances by the millions. Therefore, I passionately believe that research and education on alcohol, drugs, and tobacco is essential in order to prevent devastating harms such as addiction, overdose, incarceration, stigma, etc. Increased research in this field will lead to an increased awareness of potential harms and benefits of many drugs. As I advance into graduate studies, I plan to continue examining drug policy reform and social activism as I did in my undergraduate honors research. I am also interested in working with refugees or other vulnerable populations in the urban U.S. who experience substance abuse, and understand their connection to health care access. Ultimately, I aim to combat harmful public policies and suggest opportunities for structural reform that will benefit the lives of those suffering the most. Having just completed my BA, I now hope to attend a graduate program in anthropology next fall. I want to continue my education, gain teaching experience, conduct unique research, and eventually earn a doctorate to become a professor of anthropology. If you are an anthropology student and would like to be profiled for the ADTSG website, please contact ADTSG’s Student Liaison, Breanne Casper, at casperb@mail.usf.edu for more information! This entry was posted in Uncategorized on 14 January, 2019 by Shana.Harris. This entry was posted in Uncategorized on 15 November, 2018 by Shana.Harris.